Imams have prominent roles in tobacco control within the Somali community. They have the trust of the Somali population, and their voices are heard across a vast range of economic, social and political arenas. They can facilitate and provide spaces in the Duksi, the Islamic school for children, to educate the population on the harms of tobacco use and secondhand smoke exposure. The Duksi we have worked with has been fantastic. They have welcomed us and provided the space for health education. The children were very excited and had so much to share about their tobacco knowledge. They had a lot of fun with us playing trivia games about tobacco. The children also wrote messages about tobacco and its harms on whiteboards. Some of the messages read: “Say no to shisha” and “Tobacco is bad for your teeth because you’re going to get gum disease.” The children worked together to come up with the messages, while some of the younger ones observed. They perceived the messages as educational and as a precaution about tobacco. The children also took photos with the messages that they wrote in groups. Currently, we are teaching seven classes on the weekends, and each class has an average of 20 students. Working with Duksis allows us to extend tobacco awareness to the parents and the larger community. For instance, many Duksis hold outdoor picnics in the summer where families from the larger community can attend. 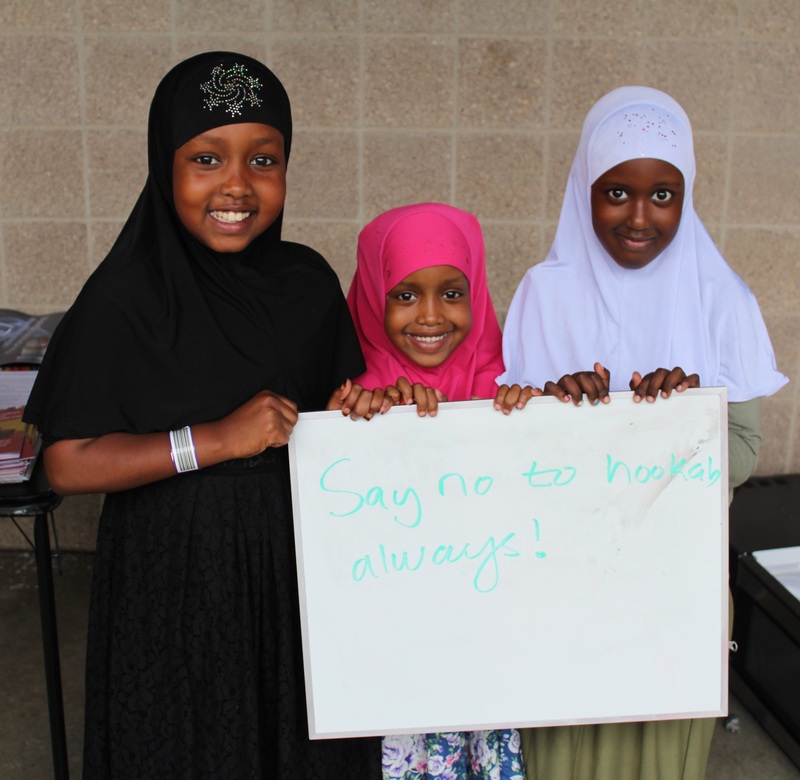 In August, we partnered with Umatul Islam Center and worked together to make their annual summer picnic smoke-free. It allowed us to interact with the parents of the youth that we have been teaching. The parents were happy to know that their children were getting this education and encouraged us to continue. Saida Mohamed educating on harms of tobacco use. There is still a lot to work that needs to be done but this is a great place to start. Public health is about prevention, and starting tobacco education when the children are still young is a great way to do it. It ensures that they do not fall through the cracks.